To help developers with app install efforts, Facebook is introducing two ad formats – Desktop Video App Ads and Mobile App Ads with the Carousel Format. Desktop Video App Ads has moved out of closed beta, expanding the ability to use video creative in desktop app ads. The video unit has similar functionality to Facebook mobile app ads and is now available through Power Editor, Ads Create Tool, API and Facebook Marketing Partners. 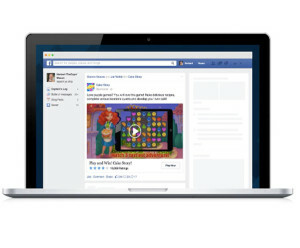 Desktop Video App Ads offers the ability to do the following: play automatically in News Feed; offer a persistent call-to-action over the video pop-up for ads rendering on the right-hand side of the page, and have an end card that appears after the video ad has finished with options to replay the video or install the game.